We have a wide range of Corporate Calendars for next year, 2019. Corporate calendar are a great way of thanking your customers at Christmas whilst also promoting your brand. The brilliant thing about Corporate Calendars is that you get exposure on the office wall for the whole of 2019! We brand them with your logo and contact details and provide FREE peel and seel envelopes. 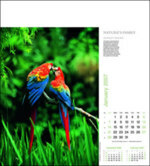 To view the range of Corporate Calendars click here. To find out more about our Corporate Calendars 2019 click here to fill in our contact form and we'll get back to you with prices and samples.